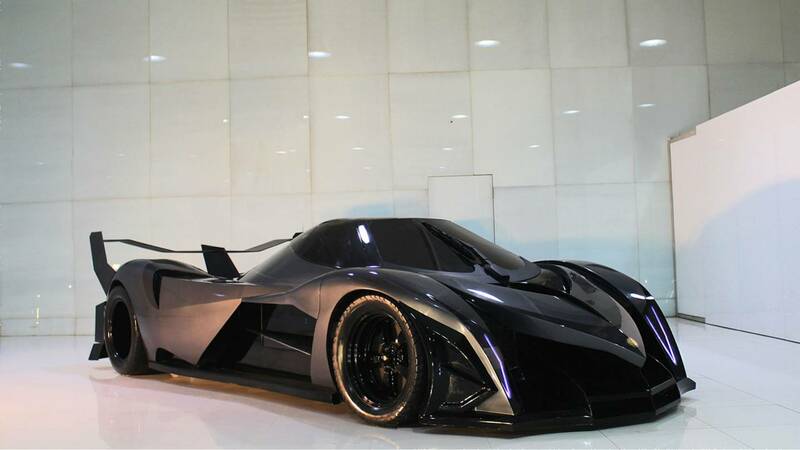 Devel Motors, the Dubai based startup, was in news in 2014 for launching their insanely powerful hyper car at the Dubai International Motor Show. The prototype caused a stir in the automobile world when the manufacturers claimed that the car is capable of reaching speeds upto 320 mph. The jaw dropping spec sheet boasted an 81 mm Quad Turbo, 12.3 Litre V16 engine which generates 5007 Horsepower and 3757 lb-ft of torque. Devel Sixteen comes in three avatars: A 5007 HP non road legal dragster, a 3000 HP version and a ‘tame’ 2000 HP version. In the following years, they have piqued car lovers’ interest by releasing exclusive footages of the car actually running. One such video showed the car launching at 20% of the maximum boost, which puts the power at 1000 HP. Devel Sixteen is built by the US based firm, Steve Morris Engines (SME). The engine is quite real, as opposed to the reservations some people had, and uses custom parts in its build. As seen in the video released by SME, the engine makes the claimed amount of power in the dyno test. See the dyno test here. As the velocity of the car increases, the fluid friction opposing the motion exponentially increases. According to some rough calculations based on the anticipated increase in the coefficient of drag, the power generated by Sixteen is sufficient to drive her at the claimed speed. The skeptics have been vocal in the criticism of the car. They point out the inadequacy of the design in expelling heat, which should be a serious concern for a car so powerful. The criticism is bolstered by the lack of vents in the front and rear of the car. Even if the engine was unrealistically efficient, it would still produce huge amounts of heat. Another valid point raised by the critics is regarding how the power is transmitted to the ground. They can’t fathom how the monstrous power can be harnessed by using traditional transmissions. Even if the car is equipped with an innovative transmission that can get the job done, the real difficulty is in putting the power to the ground. No production tires are known to withstand a speed of 290 mph or more. Producing tires for use in a production car of that capability will be a quantum leap in tire manufacturing technology. However, Rashid al Attari, the developer of the car, claimed that they used ‘special transmissions and tires’ in the prototype. He gets off the wrong foot when he claims falsely that the car is ‘totally made in Dubai’. He barely sounds convincing in the video, with his tall claims. When this author accessed the startup’s official website, all it showed was badly lit photographs of the car with a little specs scattered across the page. To top off the criticisms, the car is yet to run publicly. It has only been seen at the various editions of the Dubai International Motor Show. Until the car is available for public scrutiny, we can only speculate its capability.